Badagry (traditionally Gbagle) is a coastal town and local government area (LGA) in Lagos State, Nigeria. It is between the city of Lagos and the border with Benin at Seme. As of the preliminary 2006 census results, the municipality had a population of 241,093. 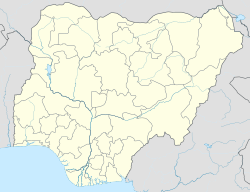 Badagry is situated on the south-west coast of Nigeria, bordered by the Gulf of Guinea to the south, it is 43 miles southeast of Lagos and 32 miles west of Seme, a border town in Benin Republic. Like Lagos Island, it is on the bank of inland lagoons, a system of creeks, waterways that are navigable to Lagos and Porto Novo. The distance between the lagoon and the ocean varies along the coast, in Badagry, the distance is about a mile. The depth of the lagoon varies according to the season, from highs of 3 meters to lows of a meter. The lagoons have a diverse fish population that includes bonga, croaker, longfin pompano, tilapia and catfish. The lagoon consists of brackish and freshwater with seasonal variability, west of Badagry, Yewa River provides water inflow to the lagoon. There is a traditional Yoruba narrative that the first settlement within the area was an Awori group originally from Ile-Ife who lived at a nearby settlement. Robin Law, a scholar on West African history, notes an origin that sprouted out of a resettlement for displaced peoples of varied ethnic groups mostly Ogu people and Oyo Yorubas. Another source links the people living at a settlement called Gberefu, an island along the coast. One of the recorded notable events in the history of the town was the acquisition of land by a European trader who was locally known as Yovo Huntokonu. Many sources identify the European to be a Dutch trader called Hendrik Hertogh. Huntokonu, who came from the west, settled in the town because he was fleeing the wrath of an African chief. He reached the settlement called Apa under the Obaship of Alapa and he was given a farmland to use for trading. Around 1736, Huntokonu set up a trading post which began the growth of Badagri main town as a center of trade. Eastward migration into Badagry contributed to the growth of the town. Badagry provided waterways to Lagos and to the interior which enhanced its commercial location. However, the rise of Badagry led to hostilities with Ouidah, which sacked the town in 1784. Commercial activities of slave traders were less in Badagri than in Bonny, Angola, Ouidah, and Calabar; in 1865, slaves transported out of Badagri were 800, while at Porto Novo, the figure was 1,200, and at Ouidah, up to 5,000 slaves were transported. The peak period of the slave trade in the city state was between 1736 and 1789, but the trade continued to the early nineteenth century. The trade was dominated by Portuguese and Brazilian traders. After the British abolished the slave trade, notable trader Francisco Félix de Sousa migrated to Badagri around 1807. The Congress of Berlin in 1884–1885, led to the displacement of the Gbe ethnolinguistic groups in the area, with especially the Badagry-Ogu ethnic group falling under the British rule, and marginalized through being removed from the rest of the ethnoliguistic group. Nigeria's first Christian Mission in Badagry. This is located at the museum of slavery. ^ a b c Harris, Lynn (2017). Sea ports and sea power: African maritime cultural landscapes. Cham. ISBN 9783319469850. ^ Bolarinwa, Bamidele; Okeowo, Timothy (July 2017). "The Species Composition and Diversity of the Coastal Waters of Badagry, Lagos State, Nigeria - EA Journals". Global Journal of Agricultural Research. 5 (2). ^ a b c d e Sorensen-Gilmour, Caroline (1995). Badagry 1784-1863. The Political and Commercial History of a Pre-Colonial Lagoonside Community in South West Nigeria (PhD). University of Stirling. ^ Kunnuji, Joseph (2017). "Guided syncretism: repackaging Badagry-Ogu music in the context of Lagos' postcolonial modernity". Africn Music. 10 (3): 79. doi:10.21504/amj.v10i3.2197. Retrieved 13 November 2018. ^ "Badagry". Wesleyan Juvenile Offering. London: Wesleyan Mission-House. VIII: 12. February 1851. Retrieved 30 November 2015. Wikivoyage has a travel guide for Badagry. This page was last edited on 4 March 2019, at 13:48 (UTC).